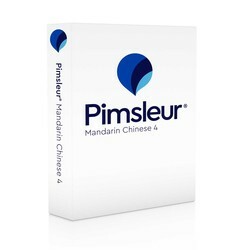 Builds upon skills taught in Pimsleur’s Mandarin Chinese Levels 1, 2, and 3. Mandarin 4 covers a variety of everyday topics. You'll be speaking and understanding Mandarin with near-fluency and with a broad range of conversational skills. In Level 4 the pace and conversation moves more rapidly, accelerating exposure to new vocabulary and structures, and approaching native speed and comprehension. You’ll learn to speak about your professional and personal life, needs, likes and dislikes, and to create complex sentences. - Understanding the Chinese: Learning cultural expressions and customs. Discussing Chinese social and economic policies. Exploring various pastimes of the young and old, such as Tai Chi, dancing on street corners, birdwalking in the park, bike riding, and more. - Discussing the weather, the air quality and environmental concerns. In Level 4, you'll continue to practice reading Hanyu Pinyin (pinyin for short) the official phonetic system for transcribing pronunciations of Chinese characters into a Latin alphabet. Twenty reading lessons are included and will build upon the pinyin reading skills acquired in Levels 1, 2, and 3. These lessons are designed to give you practice reading and to provide new vocabulary.